Being an SEO in the mid teens of the 21st century isn’t easy. You do know what happened at the beginning of September at the end the last century don’t you? Well a couple of young guys studying at Stanford University launched their search engine which focussed on their research paper from 2 years earlier. The paper was called “The Anatomy of a Large-Scale Hypertextual Web Search Engine” and they originally called their search engine Backrub. We know it today as Google of course, and it is the only search engine that truly matters at an international scale, seeing off all comers! You have read the original founding paper haven’t you? You should you know… It’s here at http://ilpubs.stanford.edu:8090/361/ and when you look at that original algorithm, that is now ancient (in search engine years) you’ll likely be surprised how close it is to what we see in today’s modern search engines. Of course we know that already… We know, through testing and even Google publicly stating recently, that links are the top and most important part of their algorithm. Exactly the same metric the original paper spoke about. However, there have been changes over time and the biggest change we’ve seen is the multitude and multiple layering of “anti SEO” techniques Google are applying to their search engine. Still much the same as it was at launch. This can be summarised as build the right links to your domain and build the general and overall status of it, to be supplemented with enough anchor text links to deliver the specific rankings you want. New domain? Build generic links. But… there is still a concern… there are still the penalties to worry about…. How do you avoid the penalties?? Well for starters you don’t do what every other SEO is doing. Google, like any vast data company look for signals and trends. They probably don’t care about one one particular SERP, they care about all of them en masse. So to avoid being hit by these filters, algo’s and things…. what should you do? I doesn’t have to be perfect, but it does need to be “good enough” – Look at the sites ranking and ask yourself this one simple question. Does my site compare equally well with the sites at the top? 2. Build real links from real sites. “Yeh, yeh yeh Jason”, I can hear you shouting, “But link building is easy to say and hard to do” and you know what…. You’d be right! Remember the little algo I posted above? If you have a high enough status in G’s eyes, then every other link you push into your site will exponentially deliver more value and benefit to you. You want domains with mostly branded and generic links. Nothing too optimised or over the top. This isn’t about anything other than looking normal and average. Statistics don’t matter here, just a nice spread of OLD links on domains that are spread around the IP namespace. I can’t stress OLD enough here. You can go off and buy them if you wish, but if you do you are potentially polluting your site’s genetic makeup and DNA so my suggestion is to always remain the sole person in charge and in control of the sites that link to you. if you do that, you can ensure the quality of the link and never have to worry about a great page or site, suddenly becoming low rent and nasty. Look inside TDN for domains to build and host with content relevant to your main site’s topic or theme. 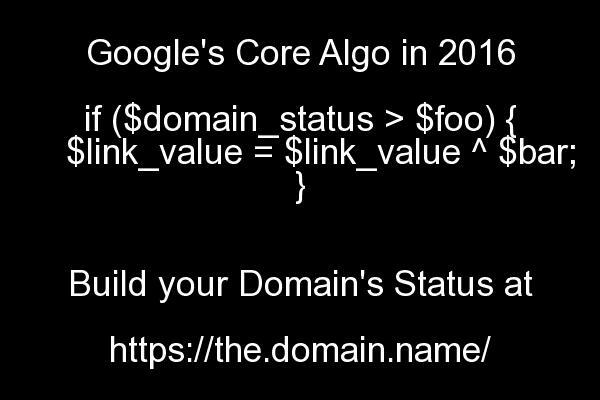 If you don’t believe me about relevance being important, then watch this video by Dixon Jones from Majestic as he talks about Topical Pagerank and whether, with the world’s largest link database at their disposal, thy think that Google cares about topical relevance…. 4. Host the site where other SEOs don’t go. Make sure you hide in shared hosting environment with thousands of other GOOD sites and never with dozens of other SEOs. If you do go the easy route, then one of their simple mistakes could cost you the earth! Worried about the cost of doing it right? Well TDN Hosting is the best you can find and with prices as low as $1.36 per month (for Enterprise Platinum customers) you’ll never need to worry about it breaking the bank, while always keeping that gene pool clean! But how much is enough? How should you plan your success against your competition? Have you read my competition assessment document? No? OK, go and read it now. I warn you though…. it’s complex and detailed but if you put the research time in you’ll have a formula for predicting success in any SERP in the world. For now though I think you have enough to be going on with. Me? … I’m off to make a cup of tea, I am a Brit after all and it’s as http as you can get!